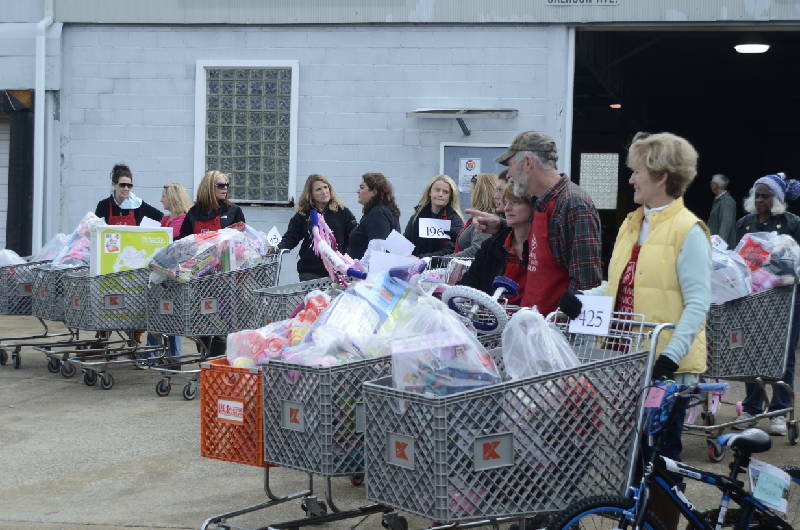 Volunteers wait with buggies full of gifts Tuesday at the Salvation Army Christmas Warehouse. The Salvation Army Angel Tree drive serves six counties. • Where: Salvation Army's Christmas Warehouse, 5001 Covington St.
Cars overflowed from the old Food Lion parking lot onto the side of the road and around the corner of the Salvation Army warehouse on Covington Street, where parents and caregivers lined up to get gifts for their children. "If it wasn't for agencies like this, what would we do?" said 29-year-old Kisha Hughes. She's a single working mom trying to provide Christmas gifts for four children. Area Angel Tree donors provided gifts and donations for some 4,525 children and seniors. Gift distribution started Tuesday. Today is the last gift distribution day in the city among United Way agencies and the Salvation Army. Gift pickup at the Cleveland Salvation Army Christmas Warehouse will be on Thursday. The Salvation Army's Red Kettle drive continues through Christmas Eve. The goal is to raise $450,000 for the Salvation's Army ministry to the homeless, to assist senior citizens and for the annual Christmas Eve brunch. "Christmas is about the birth of our Lord and Savior Jesus Christ," Salvation Army Maj. Algerome Newsome said Tuesday while directing traffic outside the warehouse. "He loved and, through loving, he gave. That's what the season for us is all about." Hughes was among dozens of parents sitting quietly inside the warehouse waiting her turn. She's excited that she landed a job at Amazon, but she's been working for only a month. That's not long enough to pay all her bills and still get gifts for her children for Christmas. This year the Angel Tree ministry allows Hughes to do both. While she waited, volunteers in the next room assembled packages. An entire wall of toys for boys including trucks, robots and dinosaurs were at the volunteers' disposal. All toys are sorted by gender and age. Toys for girls included fingernail polish, lip gloss and a Disney Princess Glow Phone. Another wall was full of shelves holding bins of underwear, pajamas, girls' tights and shoes. Salvation Army volunteers and volunteers from Dynamic Church eagerly rolled shopping carts and new bicycles across the floor as parents pulled up to fill their cars. The church has donated 1,071 bikes to the effort over three years. This year the church gave 420 after Lead Pastor Wesley Odum led a 36-hour drive to collect bikes2 outside the Gunbarrel Road Walmart. "They're going to be excited, like kids at the candy store excited," Hughes said, anticipating her children's reaction to the toys. Felicia Robinson pulled up to the warehouse door and quickly loaded a tricycle and other toys for her children. "The bills this year have been crazy," she said. "Without this I'd still be out struggling to get something."